By the light of his life and miracles. Our Holy Father Phosterios, shining from the East as the sun, went to the evening places of the West. 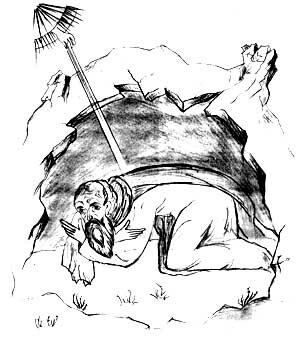 Going up a high and quiet mountain, he prayed to the immaterial God in an immaterial manner, oppressing and subjecting himself with fastings, vigils, sleeping on the ground, and every other hardship. By this he became a true luminary in accordance with his name, shining forth to the ecumene. Because he kept his body pure, and his soul clean, and the image of God within him incorrupt as much as possible, for this reason he became a dwelling-place of the Holy Spirit. Therefore the renowned one was enriched with the grace of miracles, and he healed every long-term and short-term illness, of those who came to him with faith. Not only this, but the blessed one also received bread from the heavens, like the Prophet Elijah. While Elijah received bread by means of a raven, the great Phosterios received bread by means of a divine Angel. Although by some divine economy he did not see him, every day an Angel brought him bread, putting it in a separate place so as not to appear to the Saint, and when two or three or more brothers who were strangers came, that is how many breads were found in that place, one for each of them. Who has ever seen such an extraordinary miracle? Or heard something so paradoxical? It is rare, and such things followed many rare Saints. The blessed Phosterios was made worthy of such wonders till the end of his life, as it appeared reasonable to divine Providence. When he was alone, living by himself in quiet and devotion to God, the Angel would bring him bread. When he established a monastery with the grace of God, where many monks gathered, he did not receive the bread from God, but he received it through his handiwork, not only for the needs of his own life, but he also gave it to many others for their needs. This took place, not because God was unable to. Away with such blasphemy! How would He not be able to give towards one for his needs, when He fed thousands of ungrateful Jews in the desert? Neither did this take place because God turned away from the prayers of His servant. God forbid! For the Saint never prayed for God to give him food for relief. Listen to what the Lord says: "Seek first the Kingdom of God, and His righteousness, and all these things shall be provided for you" (Matt. 6:33). Rather this took place, primarily because the Saint altogether set his cares on God, and did not take thought at all regarding his necessary food. And for this reason he did not have a servant to be anxious about bread, for he placed his needs on God's cooperation. After this, because he considered leading others in conduct and asceticism according to God, he did his handiwork and gave the brothers an example to also do handiwork. Therefore he had no need for food to come down from above. For this is the will of God and He prefers this above all other things: namely that we not be altogether unemployed and to eat our bread for free. Instead we should work, and by our work and labor we should give to others according to their need. For this reason therefore, whereas beforehand the Saint received food from an Angel, afterwards he was not deprived. And not only this, but he was commanded by God to not receive from anyone what was needed, but from his handiwork should come all that was needed for his life. Thus he taught his disciples, not only with his words, but also with his deeds. And he showed them to abide in handiwork, and in sacred prayer. The blessed one therefore, because at that time there sprung forth heresies in the Church of God, and many Fathers gathered in a Synod regarding this, then Phosterios was invited to the Synod, and he did not forego. Rather he stood among them, and did brave things, making his name wondrous. Many heretics were moved by his words, and returned from their heresy to Orthodoxy. Most, persuaded by his teachings, became monks. And simply put, many wondrous things took place through this Saint, not only while he was alive, but after he departed this life also, which took place in the evening on this the fifth day of January.